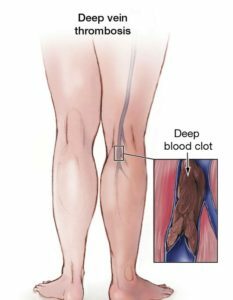 Deep Vein Thrombosis (DVT) is a blood disorder resulting from the formation of a blood clot (thrombus) inside a deep vein of the leg, commonly located in the calf or thigh. DVT occurs when the blood clot either partially or completely blocks the flow of blood in the vein. Patient symptoms include pain, swelling, and discoloration. This often happens after trauma or surgery, especially orthopedic surgery. DVT is one part of a disease called venous thromboembolism (VTE). The other part of VTE is the leading cause of preventable hospital death in the United States, Pulmonary Embolism (PE). A PE occurs when a portion of the blood clot breaks off and travels to the lungs, which can lead to death. Approximately 2,000,000 DVT cases are diagnosed each year in the United States, and DVT is the third leading cardiovascular disease behind heart attack and stroke. The U.S. spends an estimated $1.2 to $2.4 billion a year to treat DVT. Patients with DVT are traditionally treated with anticoagulation therapy (blood thinners) alone. While blood thinners are effective in reducing the risk of a fatal pulmonary embolism and growth of the blood clot, the underlying blood clot may remain, which could lead to the development of a condition called “post thrombotic syndrome” or PTS. PTS significantly impairs quality of life, causing lifelong pain, swelling, discoloration, and lack of function of the affected extremity. If you or a loved one has suffered from this condition, please contact our offices for a treatment plan devised by Dr. Greuner and his staff specifically for you.